Since 2006 Spokes has been counting cyclists and other vehicles during the morning rush hour, in May and in November, on Lothian Road and at Forrest Road [very occasionally also on other routes or other types of survey]. All the data, together with a file of trends, is downloadable below. Often the results of our counts are misinterpreted in the press and in online comments. Here, therefore, is a statement of what our counts do and don’t tell you, together with details of other relevant data sources. Total numbers of bikes (or other vehicles) entering the city centre. Total number of people (as opposed to vehicles) using the routes we count. This is similar to the council cordon counts, which also count vehicles. Counts of people numbers would be nice but it would be quite impossible for us to count numbers of people in buses, vans and cars (as well as pedestrians). We do however count the number of cars which are (or appear to be) single-occupant. Changes over the years as between different approaches to the city centre (e.g. are there more cyclists from X direction but no change from Y direction). Edinburgh Council has automatic bike counters at many locations in the city, both offroad and onroad. In 2016 this data has at last been made publicly available on the Council’s brilliant new opendata web pages [click the transport or cycling tag]. Some historic count data can also be found in the Council’s excellent Streets Ahead Cycle Incident Analysis Report 2004-2010. The Council did regular ‘cordon counts’ of all traffic entering the city centre [CEPATS] – this data was not publicly available. We are not clear whether CEPATS still exists, has now transferred to automatic counters, or whether manual cordon counts still take place. Sustrans has over 1000 automatic counters on offroad paths in the UK, including several in Edinburgh area. Sustrans publishes national annual reports [e.g. The Real Cycling Revolution, 2012 (pdf 2.3MB). News release] based on data from the counters and other research methods. Data from local counters should be available from council cycling officers, who receive it from Sustrans. 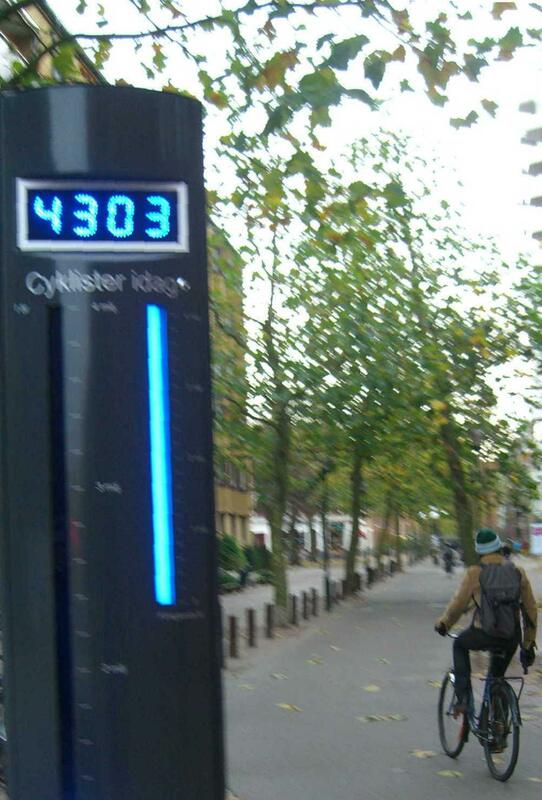 For years Spokes pressed Edinburgh Council for a European-style Public Bike Counter [picture], ideally on Middle Meadow Walk – for its promotional value as much as for the actual data! At long last it happened in 2014 – as part of a wider counter project in several parts of Scotland, coordinated by Sustrans. Live and historic data for these counters is available at falco.co.uk [click Live Counter Cycle Data] but note there are some ‘funnies’ in the data – odd spikes and missing chunks, so the data may be questionable. Cyclestreets bike data map. New facility  with many types of data including collisions, strava, traffic counts, theft, etc. When using, check carefully the source and years of validity for each type of data. See also our census data page. Note – if the Excel files below do not open directly, save them to your PC and try opening them from there. 1811 Traffic count – full data [xls] Dry, pleasant early winter day. Highest ever November bike %, but only a slight improvement on November 2017. The % increase is due mainly to lower citybound car use, with only a marginal rise in bike numbers. Good results at Lothian Road, but slight decline at Forrest Road. Blog Tweet. 1805 Traffic count – full data [xls] Cold but sunny nice-looking day. Puzzling results. Count was 1 week earlier than recent years. Bikes down at all 4 count points. Cars also down at Forrest Rd, but up at Lothian Rd and, due to the latter, bikes lower as % of all traffic. Leith St has been closed to motor traffic (open to bikes) in 1711 & 1805 counts, so one might expect a rise in motor traffic and fall in bikes at Forrest Rd, but cars actually fell. 1611 Traffic count – full data [xls] Dry, pleasant early winter day. Slight increase in number of bikes compared to last November, though the total no. of bikes is slightly below the November figures during the massive tram-building road disruptions of 2011-2014. However, further significant fall in cars, to the lowest ever, making bikes the highest % ever of all vehicles. The big fall in cars was almost entirely at Forrest Road (both directions), with only a small fall at Lothian Road. Blog Tweet. 1605 Traffic count – full data [xls] Lovely sunny day – highest ever number of bikes, lowest ever number of cars. Approx 1 in 4 of all vehicles citybound were bikes, with 22.7% even on Lothian Road. Mystery – the increase was entirely citybound, with a small decrease southbound, and the biggest car fall was southbound also. More info: news item tweet. 1511 Traffic count – full data [xls 45k] The wettest, dreichest day we have ever counted on, also following 2 very wet and windy days. Probably as a result, bike numbers down 11% on last November. Despite the weather, car numbers were also down, by 7%, to their lowest level ever. Perplexingly, southbound bikes were the highest ever, whilst northbound fell significantly, although cars fell in both directions. More info: news item, tweet. 1505 Traffic count – full data [xls 45k] Unfortunately a cold and windy day, though dry. Slight fall in total number of bikes compared to our sunny count in May 2014, with a big drop Lothian Road northbound outweighing smaller rises at the other 3 count points. However, private motor traffic fell even more, and bikes as a % of all traffic were the highest ever, at 16.5%. More info: news item, tweet. 1411 Traffic count – full data [xls 46k] Total figures almost identical to Nov 2013: bikes 9-10am up from 483 to 484!! but bikes up about 30 at Forrest Road (northbound+southbound) and down about 30 at Lothian Rd; motor traffic slightly up at both locations. Note this is first count when Meadows counter has been in place. Bikes 15.8% of all vehicles, unchanged from Nov 2013. 1405 Traffic count – full data [xls 46k] Highest ever bike total and lowest ever car count. Forrest Rd – bikes up and cars down significantly in both directions. Lothian Rd – bikes up and cars down northbound, but the opposite picture southbound – why? More comment in full news report. 1311 Traffic count – full data [xls 45k] Highest ever bike total [Nov or May]; Lowest ever November car count. Lothian Rd – bikes up (over 20% of northbound vehicles!) and cars down – may relate to Haymarket reopening. Forrest Rd – cars & commercial vehicles up significantly, bikes slightly down – impact of extra traffic appears to outweigh any benefit from QBiC. See full news report. 1305 Traffic count – full data [xls 37k] Worse weather than last May, but highest ever no. of bikes (just). Huge car rise at Forrest Road (up 33%) though overall car count total still less than in our 2007/2008 counts. Probable car transfer from Bridges & Lothian Rd to Mound, which is now reopened to all traffic (also more car restriction at foot of Lothian Rd, as access now closed to QF St). Bikes up slightly in Lothian Rd, but almost static in Forrest Rd. No obvious gain from QBiC, though it may have helped maintain bike numbers given the deterrent effect of the huge Forrest Rd car increase. 1304 Mini-count Princes St / George St [pdf 50k] A special one-off count to use in our campaign to counter the council’s proposed Princes Street bike ban. 1211 Traffic count – full data [xls 37k] Despite drizzly weather, highest ever 8-9am number and % of bikes, just higher even than the May count. Significant rise on new Quality Bike Corridor northbound. Overall northbound rise but southbound fall. Cars almost lowest ever November figure, but southbound car transfer from Lothian Rd to Forrest Rd (presumably due to Mound reopened). 1205 Traffic count – full data [xls 37k] Highest ever total and % of bikes, cars almost lowest ever May level, but taxi/bus/commercial if anything rising. 111115 Traffic Count – full data [xls 36k] Big jump in bike use – total bikes higher than any previous count including May counts! Bikes 8-9am up 12% on Nov 2010 and 15% on Nov 2009. Cars at lowest ever November level, though drop partly due to Mound closure (as in Nov ’08 & ’09). Bikes now form 20% of all northbound 8-9am vehicles at our counting points. The Bike Station also did counts today – and found similar big rises in bike use. 110517 Traffic Count – full data [xls 36k] Comparison with May 2010 unreliable because Queensferry St shut for gas main work, with traffic diverting via Haymarket (& Forrest Rd)? Lothian Rd – big fall in motor traffic, lesser fall in bikes. Forrest Rd – cars up, bikes same as last year. Overall, bikes comprise 19.7% of 8-9am citybound vehicles, whilst 77% of citybound cars have only one occupant. 101116 Traffic Count – full data [xls 44k] Increased bike traffic for the 5th successive November. But, exactly as in May, whilst bike traffic rises at 3 count points, it falls in Forrest Rd heading towards Princes St – have the tramlines deterred some? Unlike May, private motor traffic rose substantially (but only significantly at the above location), resulting in a slight fall in bikes as a % of all traffic. On Nov 16 there was also a count at Fiveways Junction [pdf 135k], by the Bike Station. 100511 Traffic Count – full data [xls 20k] Increased overall bike traffic for the fourth May – very small increase this time, but against a background of continuing fall in cars, so the % of bikes continues to rise. Fall in Forrest Rd bike traffic towards Princes St – have the tramlines there deterred some? See May 11 news item for more comment. 091117 Traffic Count – full data [xls 20k] Increased bike traffic for the fourth November – very small increase this time, but against a background of continuing fall in cars, so the % of bikes continues to rise. Highest ever November bike % on any road, 23.9% northbound on Forrest Rd, but fall in bikes on Lothian Rd. 090512 Traffic Count – full data [xls 20k] (1) Continuing consistent high bike use, plus rise in numbers since last May at every point, though % fall in Lothian Rd due to more cars (2) Overall drop in motor traffic, with big Forrest Rd southbound car reduction (due to Mound closure?) but big rise on Lothian Rd (less traffic restrictions now at West End). 081118 Traffic Count – full data [xls 20k] (1) Continuing consistent high bike use, with overall rise since last Nov (2) Big Forrest Rd southbound car reduction (due to Mound closure?) along with rise in bikes and in car sharing. 080506 Traffic Count – full data [xls 21k] Continuing consistent high bike use, around 20% of all vehicles citybound 8-9am. Also counted single occupancy cars – around 75% of all cars!! You can hide or display data for each transport mode by clicking that mode in the key. For example, to see just bike figures, click private (cars) and commercial, to hide that data. If you do this in the final graph (total of all count locations) you will see clearly the overall growth in bike numbers and decline in cars. An interesting point is how little it seems to matter whether it is May or November!